Inventory Spy is a tool for Amazon Marketplace sellers who want to see the currently remaining inventory of your competitors. 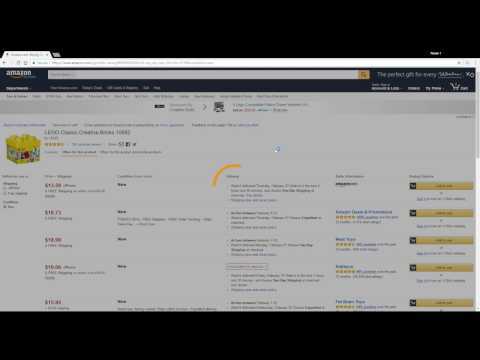 After adding the extension you browse to a product's used and new offers on an Amazon offer-listings page and click the spy icon on the Google Chrome toolbar. You will see how many units remain in stock for all offers on the page instantly. 1) Add Inventory Spy extension app to your Chrome browser. It's FREE! 2) Visit the Amazon product page you need to check. 3) Click the Inventory Spy button on browser bar to view their stock. Inventory Spy was added by ONPRE in May 2018 and the latest update was made in Apr 2019. The list of alternatives was updated Feb 2019 There is a history of all activites on Inventory Spy in our Activity Log. It's possible to update the information on Inventory Spy or report it as discontinued, duplicated or spam. Information about online ecommerce including Amazon. Get FBA estimates, estimated sales, predictions etc Research full statistics on your competitors’ sales on Amazon!. Amazon Multi tool for Amazon Sellers with a powerful Profit calculator, Stock Checker, Variations viewer. Egrow is a free web-based tool specifically developed for Amazon sellers. It will save your time in market analysis and help you find products you can easily sell. A 100% free Amazon product research tool that is for some reason called Unicorn Smasher. Amazeowl is the easiest and most affordable way to start successfully selling on Amazon. Start for free, and add functionality as you grow. Alternatives to Inventory Spy for Web, Windows, Mac, Linux, Chrome and more. Filter by license to discover only free or Open Source alternatives. This list contains a total of 15 apps similar to Inventory Spy. In my opinion, Inventory Spy is a must-have tool if you are looking to sell on Amazon. It shows the remaining inventory of other sellers and you can draw better strategies for price and re-stocking. Really expensive compared to all the other chrome extensions out there. Really frustrated at their support. Maybe you want to be the first to submit a comment about Inventory Spy? Just click the button up to your right!